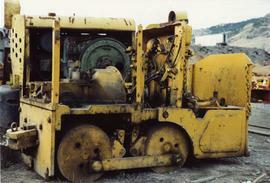 Photograph depicts a compressed air operated locomotive frame and H.K. 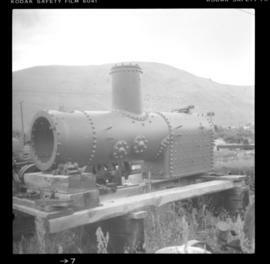 Porter boiler, built in 1912. 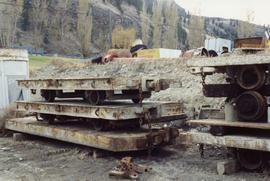 It was believed that the locomotive frame came from the Canmore coal mines. 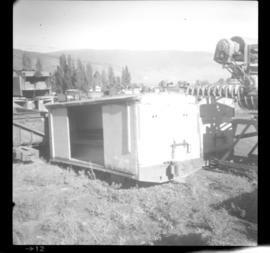 Photograph depicts a narrow gauge contractor's locomotive boiler owned by Mr. Shane Sherman of Lake Shore Road, Savona. 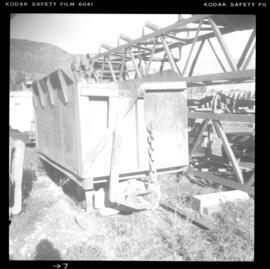 It was built by H.K. 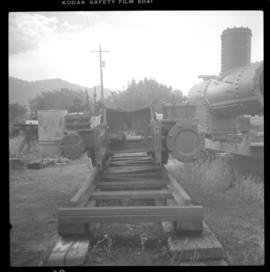 Porter as boiler #1451 B on August 18, 1912. 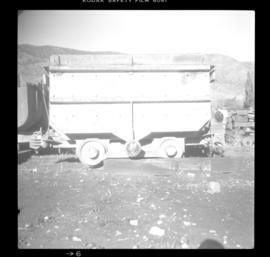 Photograph taken at the CNR Savona depot. 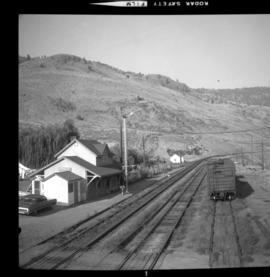 Image captured looking eastward (towards Kamloops). 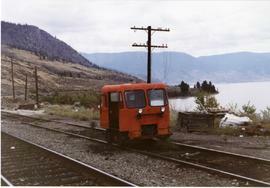 Photograph depicts a CN Fairmont speeder on a spur/siding. 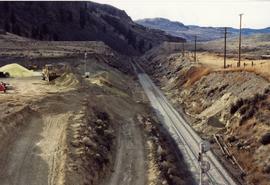 Looking east towards Kamloops Lake. 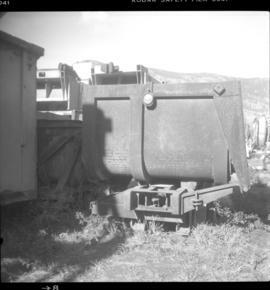 Photograph depicts the spur to the used mine machinery depot of the Nelson Machinery Company Ltd. 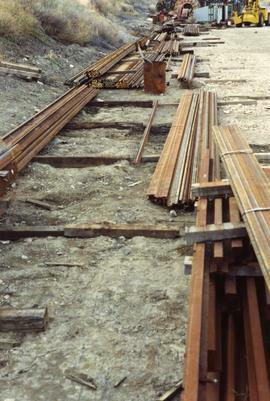 The rail found in the middle distance was property of this company, not the CPR. 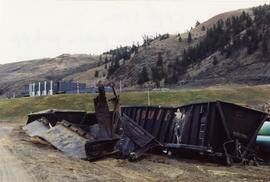 File consists of documentary photographs taken by David Davies of two CN derailments in Savona, British Columbia. 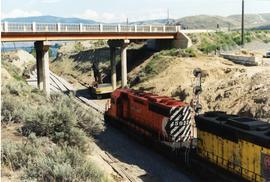 Photograph depicts a collision that occurred at the west switch of the crossing in Savona. 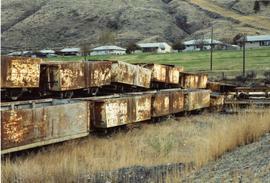 At some point, freight was derailed by huge pipes that rolled on the track in November 1991. 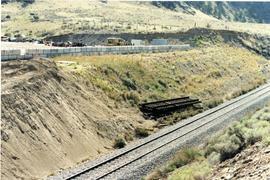 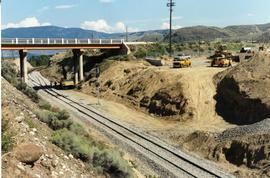 Photograph depicts the cut where gas pipes rolled in and derailed westbound freight. 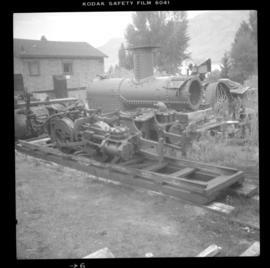 Photograph depicts a compressed air operated locomotive frame that had unequal sized cylinders (high and low pressure) and was believed to have come from the Canmore coal mines. 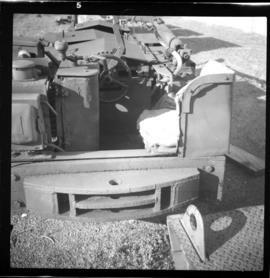 Photograph depicts a compressed air locomotive frame owned by Mr. Shane Sherman. 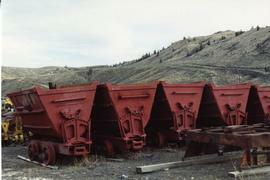 It was believed to have come from the Canmore coal mines. 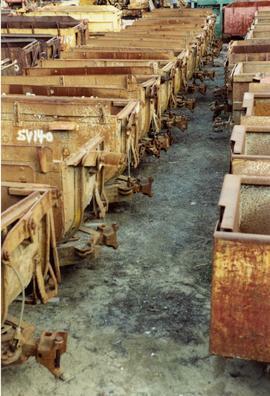 Photograph depicts the details of a mine electric locomotive. 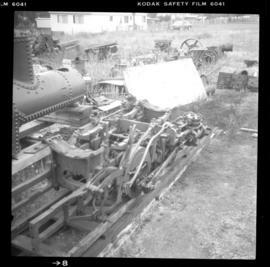 Photograph depicts an old mine electric locomotive that was on display, not for sale. 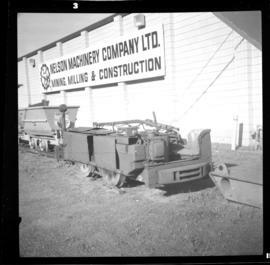 Photograph depicts the depot of the company of second-hand mine machinery, the Nelson Machinery Company. 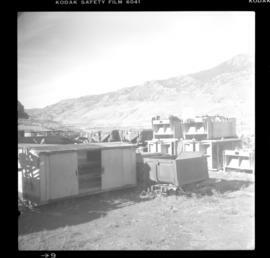 Photograph depicts a mining equipment depot of the Nelson Machinery Company in Savona. 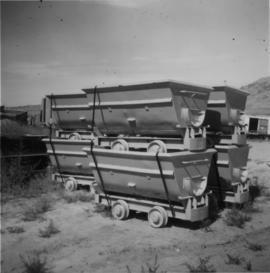 Photograph depicts tubs owned by Nelso Machinery Company Ltd. that were on display for re-sale. 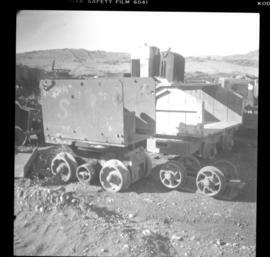 Photograph depicts a mine car body awaiting a buyer. 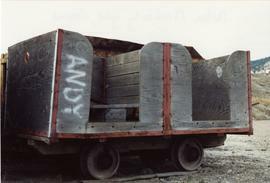 Photograph depicts a consignment of refurbished ore cars that were for a client in Saskatchewan. 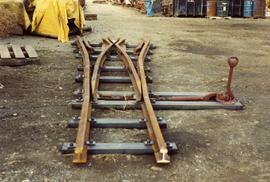 They were made by Wabi Iron Works. 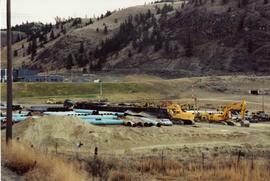 Photograph depicts a pipe yard of West Coast Gas Transmission. 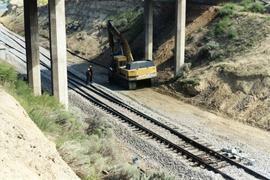 Two large pipes had gotten away and rolled onto the railway. 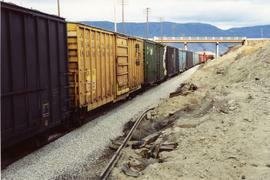 Photograph depicts the first train to move over the remade track after a derailment in Savona. 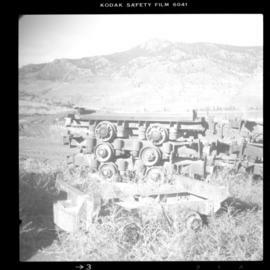 Photograph depicts a train passing over restored track after a derailment in Savona. 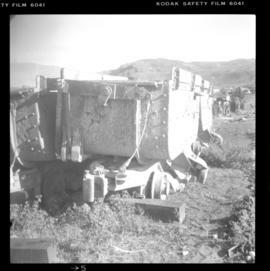 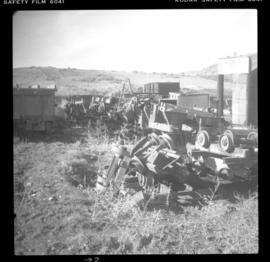 Photograph depicts wrecked sulphur cars parked in a pipe yard. 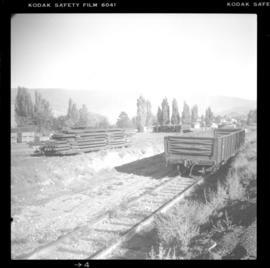 Photograph depicts the Nelson Machinery yard in Savona. 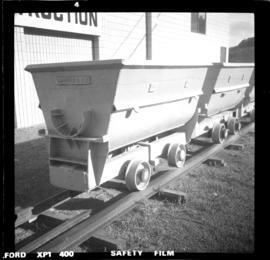 File consists of documentary photographs taken by David Davies of the Nelson Machinery yard in Savona, British Columbia.